Bar La Florida had gained international status after Constante Ribalaigua Vert inherited the Havana bar-restaurant in 1918 from owner Don Narcisco Sala Parera. Every year, beginning in 1934, La Florida gave away souvenir booklets of the recipes that tempted visitors from around the globe and captured the hearts of celebrities such as Ernest Hemingway. The bar earned a new name by the end of the 1930s, El Floridita. And although Constante had already printed the 1939 edition of his Cocktails: Bar La Florida booklet, he published this particular with the venue more familiar name. 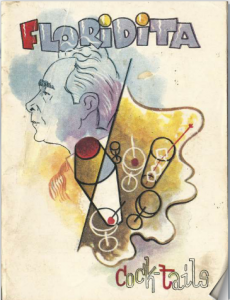 Floridita Cocktails contains precisely the same history, anecdotes, and recipes found in the previous editions with one exception.